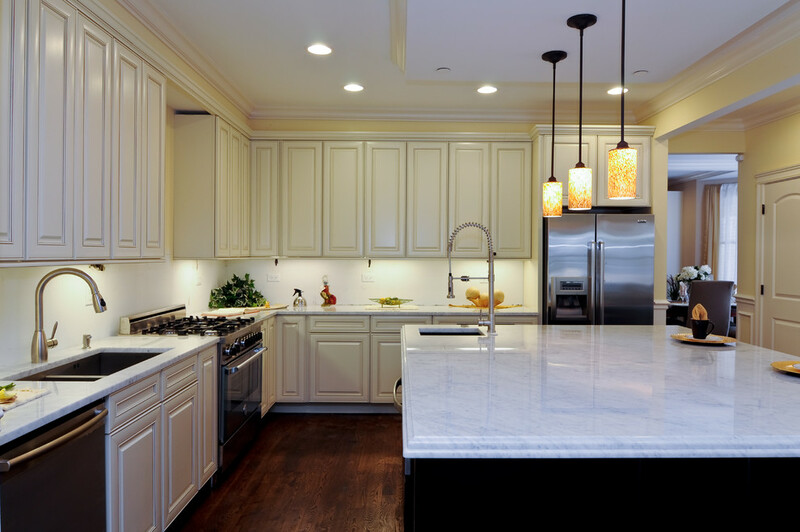 Under-cabinet lighting is one of the hottest kitchen trends this year. Releasing a gentle glow, they’re just as good for cooking under as they are for setting the mood for a social get together with friends, family, and neighbours. After all, the kitchen is fast becoming the focal point – the meeting place – of the home. Contrary to popular belief, under-cabinet lighting isn’t solely for keen hostesses. In fact, this type of kitchen lighting is becoming very popular with families, who are able to enjoy the ambience of candlelight without the risk that an open flame presents to curious little adventurers. This type of under-cabinet lighting is ideal for homeowners who love the idea of open shelving in the kitchen to show off special crockery and family heirlooms, but want an added layer of protection of glass. Brilliant white lighting installed behind the glass highlights your kitchen’s best accents effortlessly, while still managing to spread a warming glow throughout the entire kitchen area. White LED rope lights have the advantage of being flexible, versatile, inexpensive, and are very easy to fit. When attached to the underside of your cabinets, they direct a gentle glow right down onto your kitchen worktops – ideal for kitchens whose worktops are the star of the show! This direction of white light is also great for those who love to indulge in a little nighttime baking and need excellent lighting. Similar to rope lights, LED strip lights tend to be a bit thinner, which means they can be placed underneath flat-bottomed wall cabinets without looking out of place. Many LED strip lights now come in colour-changing options that can be controlled through a smartphone. This type of lighting is perfect for modern, contemporary kitchens, and also works well in white kitchens in need of a splash of colour. 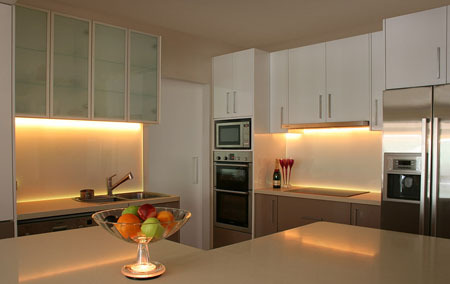 Puck lights are, perhaps, the easiest and most cost effective form of under-cabinet lighting. Many varieties contain self-adhesive backing strips which means they can simply be stuck onto the underside of your cabinets. For a more permanent lighting solution, they may also be wired in. Puck lights are great in darker kitchens with lots of corners to lighten up naturally dark and dull areas. 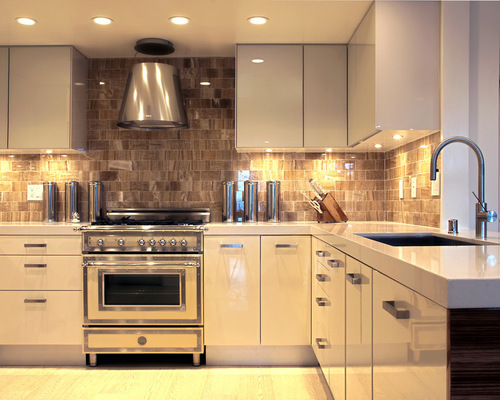 Fluorescent strips are a much older form of under-cabinet lighting, and while it doesn’t appeal to all tastes, it can be very effective in the right kitchen. The light from fluorescents tends to be a little brighter. Therefore, these lights are ideal for using as a recipe-reading light, or as a primary light in a bar or coffee-making area without the need to install stronger, overhead lights; helping maintain an ambiance. Under-cabinet lighting provides a wonderful glow, helping to make kitchens seem very warm and welcoming. Unfortunately, this atmosphere can sometimes be spoiled by the addition of direct, overhead lighting. Instead, why not consider some alternative options for kitchen lighting that better compliment this gentle glow, such as subtle pendant lights arranged over the dining table.